Includes one plastic Panzer IV tank, one plastic Panzer III tank, one plastic KV tank, one plastic T-34, one plastic Valentine tank, two plastic Tank Commander sprues, Flames Of War 4th Edition mini rulebook, one Flames Of War ‘Start Here’ booklet, two Terrain Cards, six dice and nine Unit cards. 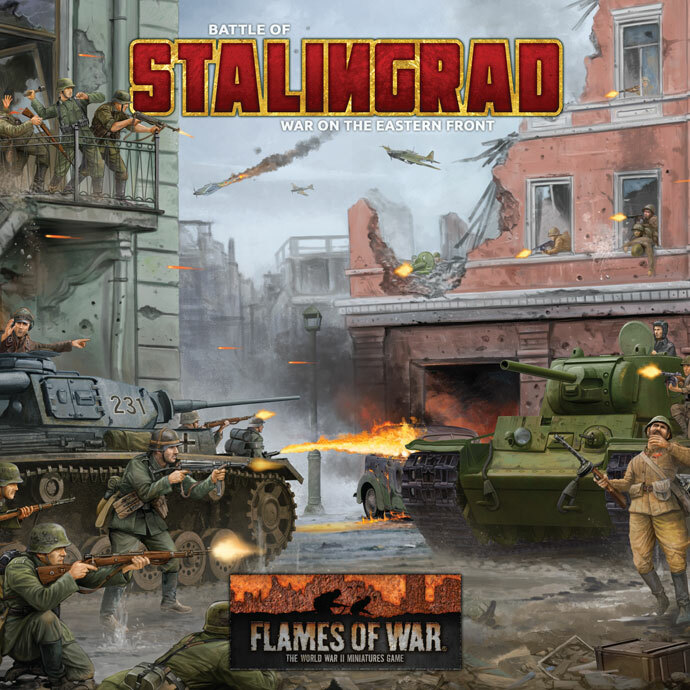 Stalingrad is your introduction to the exciting world of Flames Of War, the world’s most popular World War II miniatures game. • One plastic KV tank • One plastic T-34 tank • One plastic Valentine tank • One plastic Panzer III tank • One plastic Panzer IV tank . • Five Soviet Unit cards. • Four German Unit cards. • One Flames Of War 'Start Here' booklet • one Flames Of War Mini rulebook • six Dice • two Terrain cards. 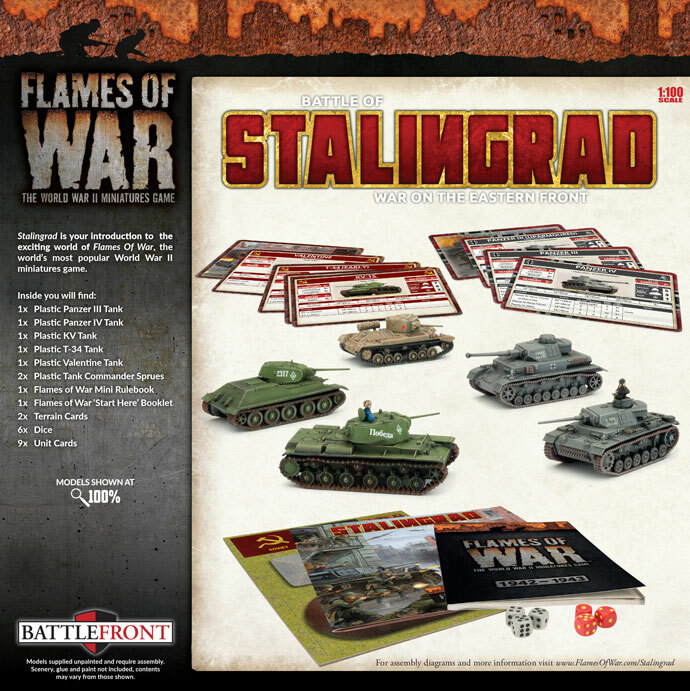 The Flames Of War 'Start Here' booklet is designed to get you playing Flames Of War as soon as possible. Glue your tanks together, grab some dice, a tape measure and an opponent and follow the instructions in this booklet to play a simple game. Once you get the hang of the basic rules in this booklet, you can delve into the full rules and start playing larger, more detailed games. Once you’ve played a few games and have a solid grasp of the rules you might find yourself wanting to expand your force with infantry, artillery, aircraft, or even a second unit of tanks! Flames Of War has rules and models that cover all of this, and more, and is available both online and in your local gaming store.